, one of the most, if not the most distinguished character of the twelfth century, was born at Fountaine, a village of Burgundy, in 1091, and was the son of Tecelinus, a military nobleman, renowned for what was then deemed piety. His mother, Aleth, who has the same character, had seven children by her husband, of whom Bernard was the third. From his infancy he was devoted to religion and study, and made a rapid progress in the learning of the times. He took an early resolution, to retire from the world, and engaged all his brothers, and several of his friends in the same monastic views with himsell. The most rigid rules were most agreeable to his inclination, and hence he became a Cistertian, the strictest of the orders in France. The Cistertians were at that time but few in number, men being discouraged from uniting with them on account of their excessive austerities. Bernard, however, by his superior genius, his eminent piety, and his ardent zeal, gave to this order a lustre and a celebrity, which their institution by no means deserved. At the age of twenty-three, with more than thirty companions, he entered into the monastery. Other houses of the order arose soon after, and he himself was appointed abbot of Clairval. 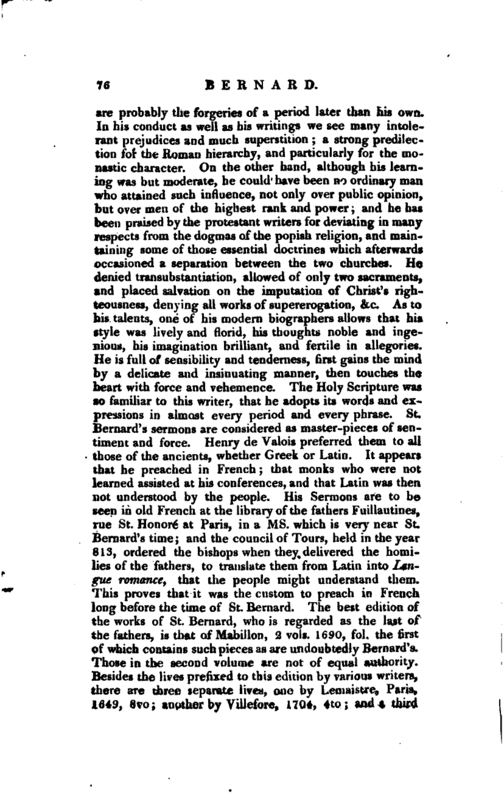 To those noviciates who desired admission, he used to say, “If ye hasten to those things which are within, dismiss your bodies, which ye brought from the world let the spirits alone enter the flesh profiteth nothing.” Yet Bernard gradually learned to correct the harshness and asperity of his sentiments, and while he preached mortification to his disciples, led them on with more | mildness and clemency than he exercised towards himself. For some time he injured his own health exceedingly by austerities, and, as he afterwards confessed, threw a stumbling block in the way of the weak, by exacting of them a degree of perfection, which he himself had not attained. After he had recovered from these excesses, he began to exert himself by travelling and preaching from place to place, and such were his powers of eloquence, or the character in which he was viewed, that he soon acquired an astonishing prevalence, and his word became a law to princes and nobles. His eloquence, great as it was, was aided in the opinion of his hearers by his sincerity and humility, and there can be no doubt that his reputation for those qualities was justly founded. He constantly refused the highest ecclesiastical dignities, among which the bishoprics of Genoa, Milan, andRheims, may be instanced, although his qualifications were indisputable. Such was his influence, that during a schism which happened in the church of Rome, his authority determined both Louis VI. king of France and Henry I. king of England, to support the claims of Innocent II., one instance, among many, to prove the ascendancy he had acquired. Yet although no potentate, civil or ecclesiastical, possessed such real power as he did, in the Christian world, and though he stood the highest in the judgment of all men, he remained in his own estimation the lowest, and referred all he did to divine grace. His power, however, was not always employed to the best purposes. The crusade of Louis VII. was supported by Bernard’s eloquence, who unhappily prevailed to draw numbers to join that monarch in his absurd expedition, which was, in its consequences, pregnant with misery and ruin. In his dispute with the celebrated Abelard, he appears more in character. At a council called at Soissons in 1121, Abelard was’ charged with tritheism, and with having asserted, that God the father was alone Almighty. 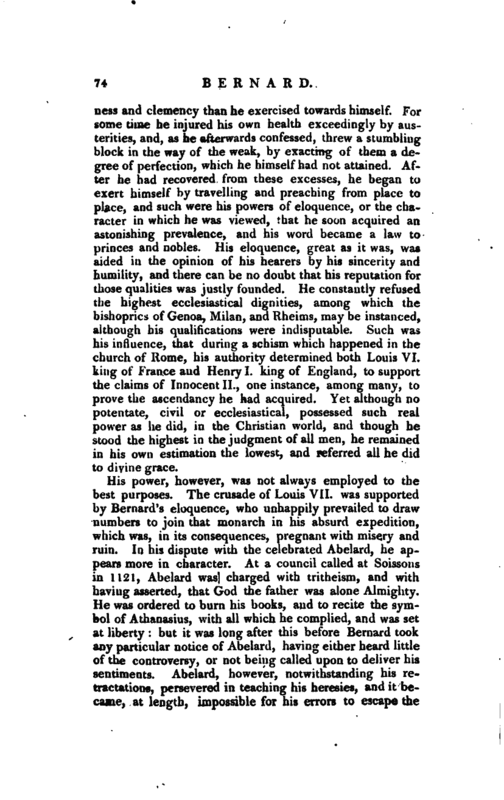 He was ordered to burn his books, and to recite the symbol of Athanasius, with all which he complied, and was set at liberty: but it was long after this before Bernard took any particular notice of Abelard, having either heard little of the controversy, or not being called upon to deliver his sentiments. Abelard, however, notwithstanding his retractations, persevered in teaching his heresies, and it became, at length, impossible for his errors to escape the | observation of the abbot of Clairv.il. Having studied the subject, his first step was to admonish Abeiard in a private conference, but finding that that had no effect, he opposed him in some of his writings, on which Abelard challenged him to dispute the matter at a solemn assembly which was to be held at the city of Sens in 1140. 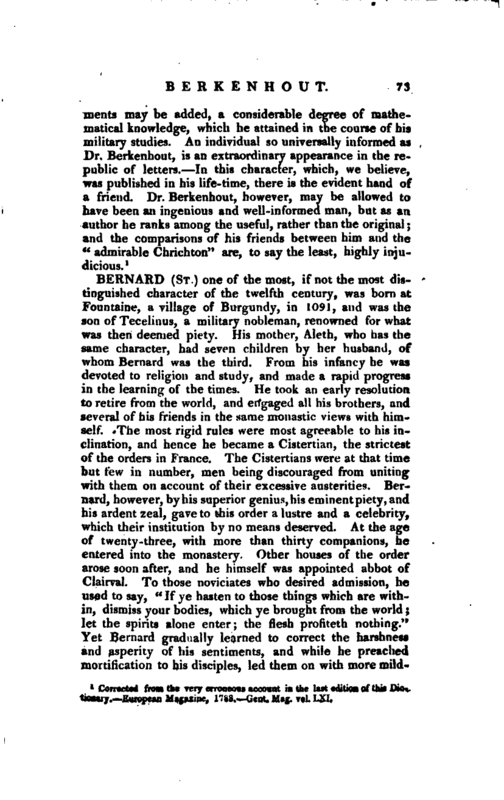 Bernard was at first unwilling to subu-it these important doctrines to a decision which was rather that of personal talent, than of deliberative wisdom, and would have declined appearing, had not his friends represented that his absence might injure the cause. He accordingly met his antagonist, and began to open the case, when Abelard very unexpectedly put an end to the matter by appealing to the pope. 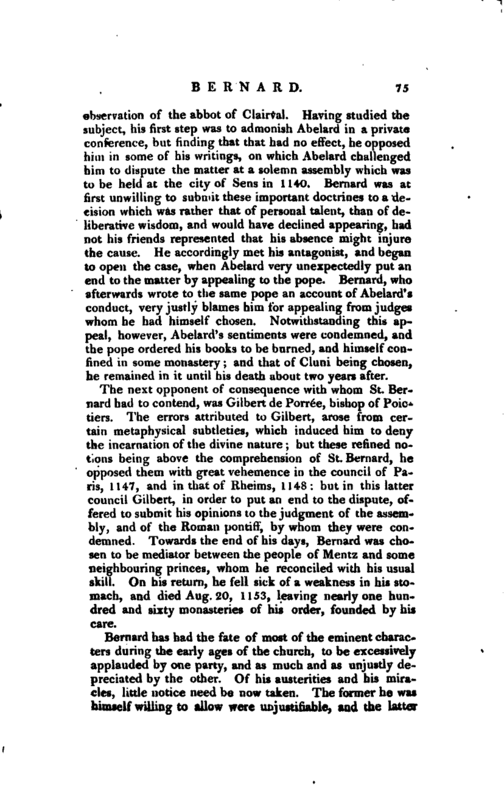 Bernard, who afterwards wrote to the same pope an account of Abelard’s conduct, very justly blames him for appealing from judges whom he had himself chosen. Notwithstanding this tippeal, however, Abelard’s sentiments were condemned, and the pope ordered his books to be burned, and himself confined in some monastery; and that of Cluni being chosen, he remained in it until his death about two years after. The next opponent of consequence with whom St. Bernard had to contend, was Gilbert’de Porree, bishop of Poictiers. The errors attributed to Gilbert, arose from certain metaphysical subtleties, which induced him to deny the incarnation of the divine nature but these refined notions being above the comprehension of St. Bernard, h6 opposed them with great vehemence in the council of Paris, 1147, and in that of Rheims, 1148: but in this latter council Gilbert, in order to put an end to the dispute, offered to submit his opinions to the judgment of the assembly, and of the Roman pontiff, by whom they were condemned. Towards the end of his days, Bernard was chosen to be mediator between the people of Mentz and some neighbouring princes, whom he reconciled with his usual skill. On his return, he fell sick of a weakness in his stomach, and died Aug. 20, 1153, leaving nearly one hundred and sixty monasteries of his order, founded by his care. 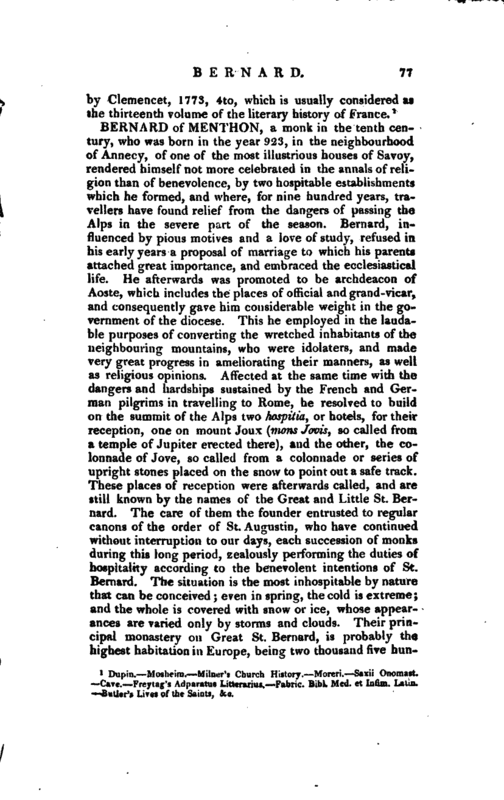 Dupin.—Mosheim.—Milner’s Church History.—Moreri.—Saxii Onomast. —Cave.—Freytag’s Adparatus Litterarius.—Fabric. Bibl. Med. et In Infim. Latin. —Butler’s Lives of the Saints, &c.